Thanks to my sister in law for this wonderful idea of baked s'mores. Making s'mores in the oven is so much less messy but also fun to do when you aren't sitting around a campfire. When we were camping recently, there were no campfires allowed due to our drought here in California. Everyone wanted s'mores so my sister in law suggested we due them in my trailer oven. Now first get yourself a disposable pan from the dollar store. Spray a bit of non stick spray in the pan. 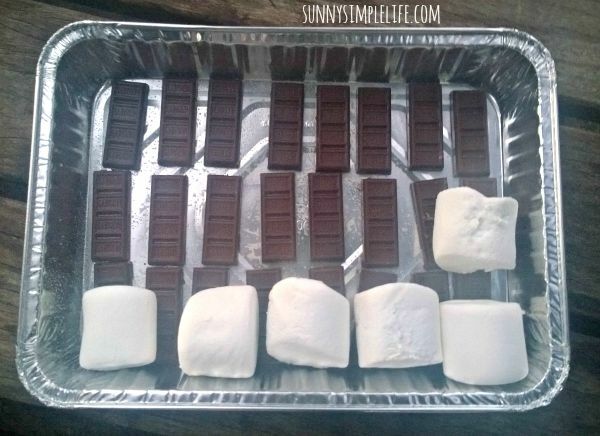 Line your chocolate up first along the bottom of the pan and them arrange the marshmallows along the top. We used the extra large marshmallows here. They are our favorites for s'mores. Can never have enough gooey marshmallow goodness. Place the s'mores in the oven at 300 degrees for about ten minutes. Watch until the marshmallows are nice and soft. 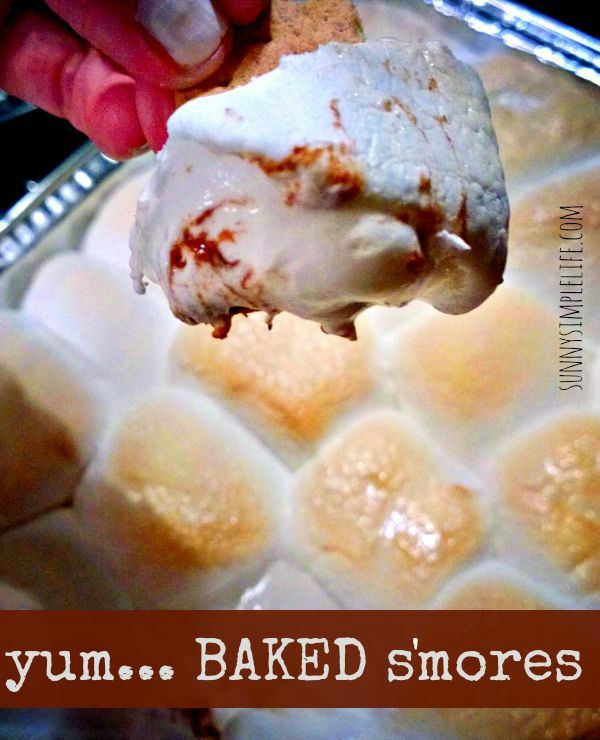 You can stick them under the broiler for a few seconds to just brown the tops of the marshmallows but watch them constantly. When done serve them with graham crackers and a spoon so everyone can scoop some s'mores up onto a paper plate. I did not need to find this recipe! We sit by the fire pit several nights a week and sometimes I wish I had the ingredients for S'mores.